Dr. Landon Lavene, PT, DPT gained his doctorate degree in physical therapy from the University of St. Augustine in Austin, Texas. He has experience in treating all patient populations including outpatient orthopedics, acute care, sports rehabilitation, neurological, geriatrics, and post-surgical rehabilitation. 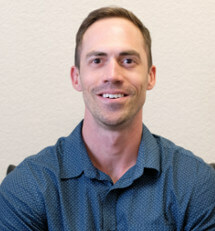 With advanced education in the field of manual physical therapy, Dr. Landon Lavene, PT, DPT is well equipped to treat both common and uncommon spine conditions and sacroiliac disorders which are often key contributors to complaints of low back pain and neck pain. He is also a certified ImPACT trained physical therapist, with advanced certification in concussion management which involves the treatment of concussion symptoms including headaches, mental fog/fatigue, vestibular-ocular deficits, dizziness, vertigo, and neck pain. Dr. Lavene, PT, DPT enjoys spending his free time in the outdoors enjoying all that the four corners area has to offer. Whether it is hiking, mountain biking or snowboarding, the San Juan mountains have become his second home ever since making the move to Southwest Colorado.